For an avid golfer, any technical advantage can help you win more rounds. These gadgets are designed to help you gauge the distance to the hole, examine your swing, and even keep a digital a scorecard you can share on Facebook. Most importantly, they are fine-tuned for outdoor use on the course with rain-resistant features and long battery life. One of the best features on the Bushnell NEO-X Rangefinder GPS golf watch is that it lasts 16 hours per charge - that's about twice as long as previous models we've tested. With the longer shelf life, you can expect to finish all 18 holes and still use the watch at the clubhouse. The main purpose of the watch is to check distances so you can pick the best club. Knowing you have a long drive to the green is one thing, Knowing you have exactly 180 meters is more helpful. It's about time someone invented a new way to keep score. The Game Golf uses both a GPS receiver and near-field communication to record which clubs you used, when you swing, and the distance you cover. There's a belt you wear and small pins you attach to each club. When you are ready to swing, you tap the club on the belt clip - it syncs over NFC. When you are done with the round, you can upload the scorecard and even share results on social nets. Designed for both iOS and Android mobile devices (including smartphones and tablets), the GolfSense is a Bluetooth sensor you attach to a golf glove. When you swing, you can see a 3D rendering that shows an overswing, poor positioning over the ball, and tempo problems that can cause a slice up the fairway. The sensor works from about 10 meters away, so it's ideal for both home practice, the driving range, and on the course. The Bushnell Tour v3 rangefinder has a brand new feature called JOLT, which emits a soft vibration when you lock onto the flag. 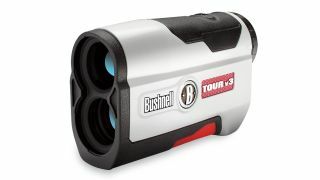 The Tour v3 uses a laser to pinpoint the exact distance through a viewfinder. You press a button to activate it and can see the distance. Our favourite new feature: the device is accurate to within just one meter, which can help you gauge how far you need to put on the green. The device has an ergonomic handle for a better grip. There's a "zipperless" golf bag to store gear for easy retrieval - especially if you are in a hurry. The Swing Perfect Club Swing Trainer is an ultra-light clip-up sensor (which weighs only 10 grams) which can measure your swing in real-time. Thankfully, it doesn't use an app - which means you don't have to retrieve your phone or sync up over Bluetooth. Instead, a gyroscope tilt sensor determines if you are using an improper plane - the straight front-to-back movement required for a good swing. The device vibrates more when you have broken the plane or turned a club. You may already own one of the best golf gadgets: your phone. The Swing by Swing app for iOS and Android shows GPS-generated course maps so you can spot exactly where you are at all time and gauge the distance to the hole. The app is free and allows you to keep score. A new feature for instructional help: you can now record your swing and upload for pro tips. Everything you need to know about the tech that went into the TaylorMade Daddy Long Legs putter is summarized by this: it has a moment-of-inertia (MOI) rating of 8500, much higher than most. There are multiple materials used in the design, including stainless steel, carbon steel, aluminum, titanium, tungsten, and polycarbonate to make sure you hit the sweet spot and don't turn the club.